No Worries is a book of activities for kids and young teens who struggle with anxiety. It uses art, activities and visual exercises to teach coping skills that can be helpful for working through worry. Dr. Sharie Coombes is a neuropsychotherapist and children’s hypnotherapist practicing in the UK. She runs a private practice and has published several articles on parenting or childhood mental health. You can learn more about her here. 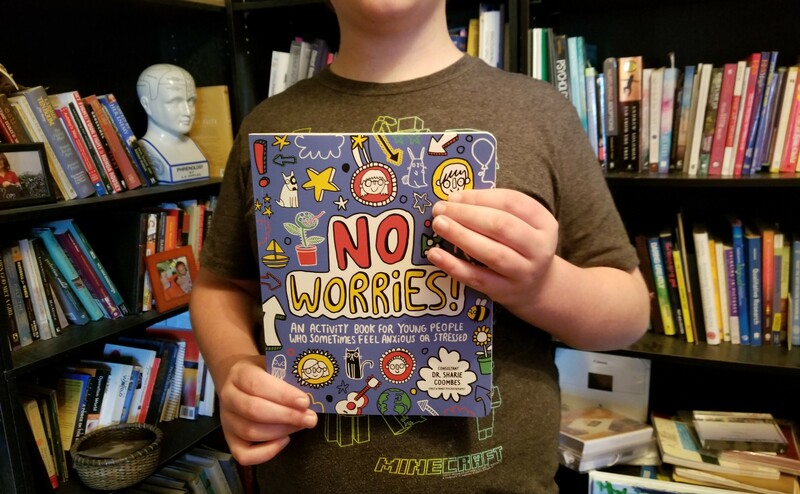 No Worries is a fun book full of creative activities that can be helpful for kids learning how to cope with their anxiety. I especially appreciated the broad spectrum of activities because kids can try several options and find what works for them. It includes everything from coloring mandalas, challenging thoughts, identifying body sensations, yoga, and identifying supports. I also liked that they included outside resources for acute issues. Another great aspect of this book is it’s versatility. You could use individual pages in sessions or send the book home with a kid to work through the whole thing over time. No Worries has a ton of pages focused on coping with anxiety but rarely helps kids address the root causes of their fears. Kids who have severe trauma histories or who live in chaotic environments might not benefit from some of the activities. In those cases, I would feel much more comfortable using select pages in session than sending a copy home. No Worries can be used in session with older kids or younger teens. Many of the exercises would fit well in play or activity therapy. It would also be a great resource to send home with clients to use as homework. The price point is low enough that I feel comfortable recommending it for families or purchasing several copies to keep at the office. You can find more resources for working with young clients here. If you know of another book that belongs on this list let us know here or tell us about it in the comments. Make sure you’re also following The Therapist’s Bookshelf on Facebook and Instagram.